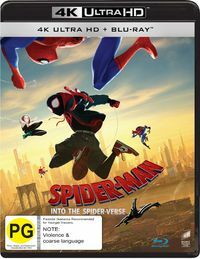 The Blu-ray of the Oscar-winning Spider-Man: Into the Universe will include more than 90 minutes of extras, some of which will feature on the 4K-UHD disc as well, when it goes on sale on April 17 (two weeks after its digital debut). There also will be a 3D release that isn’t for sale in the US, where critics have been ecstatic about the 2D and 4K Blu-rays. “The High Dynamic Range HDR10 grade is magnificent,” The Digital Bits said (Dolby Vision will be offered only on the 4K stream). “Without HDR or the added benefit of 3D, the 1080p does feel like a notable step down,” High-Def Digest said of the Blu-ray. Spider-Man: Into the Spider-Verse arrives filled with engaging bonus materials that are fun for the whole family and give fans even more of the unique comic book style action that they loved in theatres with over 90 minutes of bonus content.In his very own original short, Spider-Ham: Caught In a Ham,fan favorite Spider-Ham defeats his greatest foe, delivers sidesplitting puns, and get sucked into another dimension! It actually cang et weirder! Don’t miss the thrilling Alternate Universe Mode where fans can view the film in an entirely new way to discover alternate scenes, plotlines, characters, and more with the filmmakers as their guide. Also included is The Spider-Verse Super-Fan Easter Egg Challenge, where fans are challenged to find every single Easter Egg hidden within the Spider-Verse (and there are a lot of them!). Explore the character design in the visually stunning film including specific looks at the now-iconic Spider-Ham character as well as the classic villains who inhabit the Spider-Verse. Additional special features include a celebration of the diversity in the film and the idea that anyone can wear the mask in a feature called We Are Spider-Man, a featurette called Spider-Verse: A New Dimension, where fans can hear from the artists and filmmakers who pushed the boundaries of the comic book art form to create a visual experience unlike anything done in animation before, a showcase of all the amazing fan favourite characters featured in the Spider-Verse and the actors who bring them to life, and a touching tribute to comic legends Stan Lee and Steve Ditko, who originally created the Spider-Man character. Other bonus materials include two lyric videos featuring “Sunflower” by Post Malone and Swae Lee and “Familia” by Nicki Minaj and Anuel AA (feat. Bantu). We Are Spider-Man:Exploring and celebrating one of the key themes of the film, We Are Spider-Mantakes a deep dive into the diversity of the characters and aspirational core that any person from any gender or cultural background can wear the mask. Spider-Verse: A New Dimension: With a stunning visual style and state of the art animation designed to take the viewer into the pages of a comic, Spider-Man: Into The Spider-Verseis not only a love letter to comic books but a groundbreaking take on the super hero genre. Hear from the artists and filmmakers who pushed the boundaries of the artform as they discuss their journey. The Spider-Verse Super-Fan Easter Egg Challenge:The Spider-Verse is loaded with Easter Eggs, from cameos to comics references. Fans are challenged to find them all! Heroes & Hams:Meet the amazing Spider-people of the Spider-Verse. Scorpions and Scoundrels: Explore the classic villains whowreak havoc on the Spider-Verse.